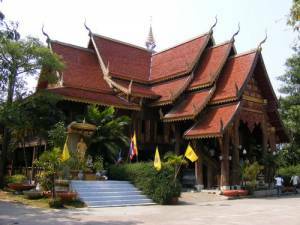 Wat Pa Tung Located in the OnTai district,San Kamphaeng. The original temple was abandoned. With the County. Before the temple Building it was found a Bone of Buddha. And many valuable artifacts such as statues, porcelain-chinaware. Currently stored in Porcelain museum. Located in the temple. The hall is home to the funeral of a monk. Was my reply, which does not decay. Those that are believed to be worshiped.